From a four-star chef's gluten-free pasta concept to a homemade bitters kit, these culinary campaigns are worth supporting. Everyone has a dream. And sometimes you need a little helping making them happen. Kickstarter‘s there for that. Started in 2009, the crowdfunding site helps start-ups and veteran entrepreneurs alike, giving them the platform to get their business or ideas off the ground. Last year, we featured 10 Kickstarter campaigns doing awesome things. Now, it’s time to see what new projects are percolating. From a revered chef’s gluten-free pasta restaurant to a grasshopper-eating initiative, here are 10 culinary campaigns worth supporting. Why we like it: After noticing a surge of diners with gluten sensitivities, Del Posto chef Mark Ladner decided to create a gluten-free pasta concept with “the warmth of Grandma’s cooking in a family-friendly, ready-to-eat ramen shop setting.” The four-star chef plans on opening kiosk-like Pasta Flyer restaurants in several major cities and launch a “pop-up truck pasta tour,” traveling to NYC, Chicago, Boston, Washington D.C, Providence, Philadelphia, and the Bay Area. Bonus: The bowls all cost under $10. Not bad considering Del Posto’s five-course menu is $126. Why we like it: Philadelphia’s Federal Donuts is famous for its donuts, of course, but also its fried chicken. And the restaurant makes a lot of fried chicken, using whole, antibiotic-free birds. Until now, Federal Donuts discarded 1,000 pounds of leftover chicken backs and bones each week, which is “absurd,” the Kickstarter says, especially in the one of the poorest large cities in America. The new goal: Turn these otherwise scraps into chicken stock and for-sale soups. Federal Donuts will donate 100 percent of all its soup profits to Broad Street’s Hospitality Collaborative, which feeds 1,200 impoverished people a week and provides services like clothing and psychological counseling. Why we like it: Steaklocker combines “old world dry aging techniques with sophisticated modern technology,” allowing you to dry age steaks at home for at least 50 percent less than dry age retail prices. Dry aging usually requires hanging steak in a temperature- and moisture-controlled room for a minimum of 28 days, allowing microbes to impart a deep, funky flavor to the meat. With Steaklocker, all you do is buy some meat, put it in the fridge, and wait 21 days. Currently in development: a Steaklocker smartphone app that gives you updates on fridge’s the temperature and humidity. Why we like it: It’s a coffee grinder, dripping kettle, dripper, and mug all combined into a single, portable tumbler. Since coffee is the nectar of the gods (and main reason we’re awake right now), being able to make great pour-over anytime, anywhere is crucial. Why we like it: Last year, North Brooklyn Farms turned a vacant lot in Brooklyn into a farm space, using the land to teach elementary school children how food is grown, host farm-to-table dinners, and allow volunteers to reconnect with their “green thumb.” Now, it wants to do it again. The kickstarter’s goal is $15,000, but for every additional $15,000 raised an additional vacant lot will be turned into an urban farm. It’s nature, folks, and it’s important. Why we like it: Care Cups are single serve, recyclable pods filled with freshly roasted coffee—an improvement on the convenient but wasteful K-cup trend. Also notable: This business is run entirely by people with developmental challenges, giving them economic and work opportunities they might not otherwise have. The goal is to help them “find a place in the world just like you and me,” the Kickstarter says. Why we like it: Brewbarrel is home-brewing for dummies, allowing you to make customized beer at home in one week. All you do is choose your beer style, hops, and flavors (like lemongrass or lime) from Brewbarrel’s website, receive a box of ingredients in the mail, and follow the fermentation and tapping instructions. You can tell your friends you brewed your own beer, even though it’s dead simple. 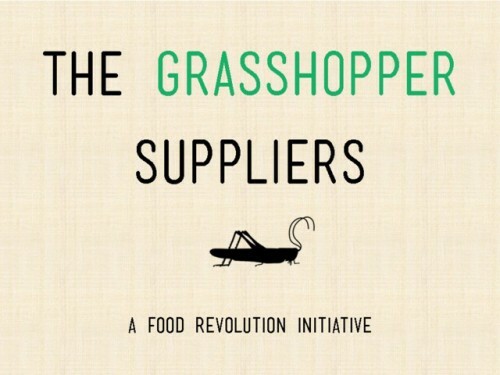 Why we like it: Since eating insects is apparently a thing now, why not support a European Kickstarter trying to make edible grasshoppers affordable and acceptable “at the dinner table”? Not only are grasshoppers an environmentally friendly form of protein, but they also boast a “slightly nutty flavor.” Deep-fried grasshoppers, anyone? Why we like it: Oreo and Barilla already jumped on board the 3-D printing train, and now there’s an “affordable” paste extruder attachment for 3-D printers. This means one, very important thing: You can print with Nutella. That’s a future worth investing in.